When it comes to roofing Woodward, Oklahoma homeowners and business owners trust Curb Appeal as its Woodward Roofing contractor for installation and repair of a roofing systems that deliver quality and lasting value. Your home's roof provides essential protection against the rain, wind, sun and storms we experience here in Woodward, Oklahoma and surrounding Areas. You can't afford to settle for second-rate roofing materials or sloppy workmanship. Woodward based Curb Appeal Roofing is a Oklahoma State Certified HVAC and Roofing Contractors company specializing in modern day roofing applications. 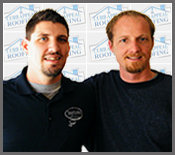 Our main area of expertise is a roofing contractor in Woodward Oklahoma. We work with roofing applications such as tile, flat, shingle, metal, and specializing in commercial flats.